In B2B, less is usually more. So when David needed to add impact to this vital report into workplace mental health, he started by cutting 40% of its length. Sometimes, if you have too much information, the main message gets lost. There’s lots of detail, but what does it really mean? That’s what it was like when Angela from AdviserPlus asked me shape some detailed research findings into the Mental Health Report 2018. Tonnes of brilliant information, but the overall message was getting drowned out. And that’s important, because in it, 145 HR leaders revealed some pretty eye-opening things about the way big employers handle mental health. Ironically, one of those findings was that board members routinely underestimate the importance of the issue. We didn’t just need to engage our HR audience; we had to give them the tools to make that case at the highest level. And that meant keeping things simple. I got my scalpel out, and came up with three big findings that we could lead with – and put them all under one central theme: it’s time to listen. 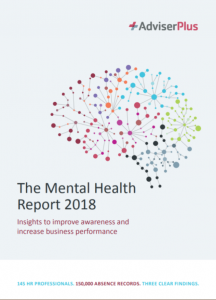 The finished piece covers each of the big issues (the rise in mental health-related sickness among men; the persistent problem in financial services; the lack of awareness at board level) on a single page – backing each up with facts and figures, and with plenty of room for illustration. There’s also a page of advice on next steps, and a call-to-arms introduction. The research methodology – impressive though it was – we banished to an appendix. Angela loved it, and – most importantly – AdviserPlus’s audience of HR leaders did too.